Hello, Gorgeous! : Summer Style Link-Up! After spending a week in beautiful Puerto Vallarta, Mexico, celebrating my friend Nicole's wedding, I'm back at it with a fab hosting gig. Today I'm excited to co-host my first ever style link-up with the gorgeous Tara from Mix & Match Fashion! I first discovered Tara's blog through Pinterest and it has since remained one of my absolute favorite blogs. Not only does she have fantastic style, but she's a working blogger who posts tons of office-appropriate outfits. Plus, her looks always include lots of prints and colors-- a win-win in my book! For this Summer Style Link-Up, I wanted to mix it up and try something new. 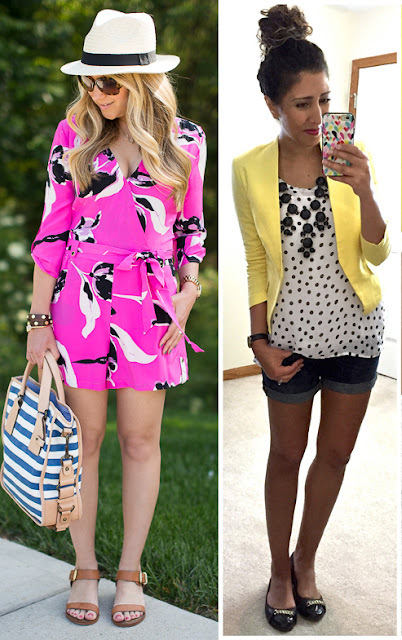 So, I decided to pair a bright yellow blazer with cuffed denim shorts and flats. Hey, if you can wear a blazer with regular jeans, why not wear one with jean shorts?! And even though I had all but sworn off bubble necklaces last year (I wore them NON-STOP for quite a while), I really liked how this black bubble necklace played into my black and white polka dot top. Finally, I threw on a pair of flats...and voilà! Thanks for having me as your co-host for this Summer Style Link-Up, Tara! 1. Follow Hello, Gorgeous! via bloglovin' and Mix & Match Fashion via bloglovin’. 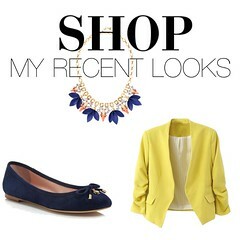 Loving the yellow blazer! It adds the perfect pop of color and dresses up your denim shorts. Such a cute outfit! Branded accessories wholesale is incredible!